Please share this story with your friends, the Thin Blue Line is always appreciative of good press. Such a great story. We need stories like this covered in the news more often. Definitely representing The Thin Blue Line with style. I saw this on on the news this morning, such a good man. People need to understand there are lots of officers out there like this, I wish the news would run more stories like this one. Glad to see someone catching this on video and posting it. Too many turds want to post only the negative contacts. I have done something similar and am sure many here have too. Not all homeless cause problems. In my city we know the ones that do cause trouble well. Others we see everyday and do not even know their names because they are not problem causers. I wish that more people would see this side oth our LEO's. 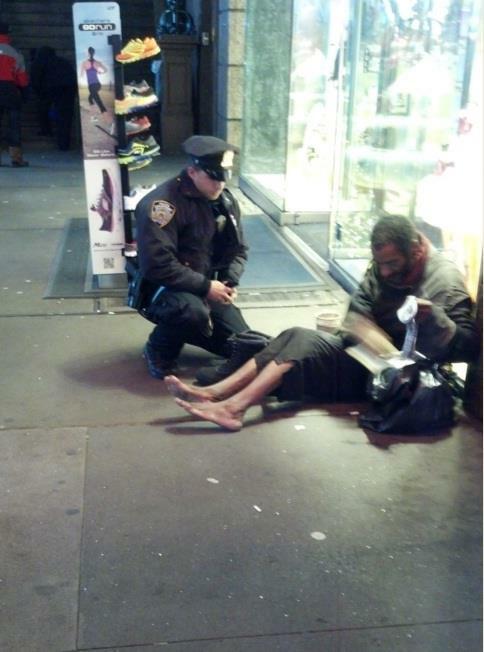 Not all cops are corrupt. You don't always hear that story on the news about a fire fighter or EMS personel selling/doing drugs/deals or taking advantage of their position! Cops end up with the short end of the stick 9/10 times. Just wish more stories like this, reguardless of the time of year, would come up to the public's eyes. Thanks to those who have a heart. The homeless man is barefoot again and now he's saying he wants a pay off for his likeness going viral. What an douche monkey! Glad the news ran this story, they need to run more stories like this. The news focuses on the bad and hardly shows the good that is done every day by law enforcement.